Ever since we were little, my mother made sure we ate a lot of vegetables. When I think of it, my brother and I were never picky or fussy about eating our vegetables. My mother and my Nana (maternal grandmother) who lived with us, taught us the value of food and ingrained in us how we were lucky to have meals that were lovingly prepared, when there were so many all around the world that had to go without any. And that lesson has staying with us till date. For this we are ever so grateful. Very often, I find myself with not much in the fridge, especially towards the end of the week, just before grocery shopping. On one such occasion, I had a few veggies, none of them enough to make a dish in itself, so I thought I'd just combine the lot of them. I also had some leftover falafel from a previous trip to Costco so I added them to the mix. 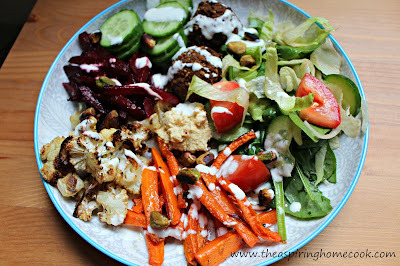 What I ended up was this glorious winter veggie bowl. Putting together a veggie spread like this is so simple and requires very little hands on time. And the best part is you can swap these veggies for any that you have in the fridge. I added a simple salad and dressing over it and topped it with some roasted peanuts. I can't tell you how satisfying it is to dig into a bowl like this - veggies in all their glory. I could live on food like this. You won't even miss the meat and all these beautiful colors are really good for you too. That's a win win. The recipe below is not quite a recipe, just guidelines if you want to whip up something like this. Please feel free to change as you wish. When prepping the veggies, try and cut them the same size so that they cook evenly. I roasted each vegetable in a separate baking dish, but if you prefer, you can use the same dish. Cut the carrots, sprinkle with salt, pepper and a drizzle of olive oil. Toss well to coat and place in a baking dish in a single layer and bake for 15-20 minutes or till cooked to your liking. Flip the carrots halfway through the cook time. Sprinkle the cauliflower florets with salt, pepper and a drizzle of olive oil. Toss well to coat and place in another baking dish in a single layer and bake for 15-20 minutes or till cooked to your liking. Flip the carrots halfway through the cook time. Heat a pan and roast the pistachios on medium flame till they've lightly browned. Stir all the ingredients through and set aside. Place the cut beetroot, roasted carrots, cauliflower, falafel, hummus, olives and the salad in a bowl. Drizzle the dressing over it. Serve a little extra on the side for the falafel. Top with the roasted pistachios. We are all about "the bowls"! Thanks for a great recipe! Date and Walnut Cake .... keeping it real !! !